Posted on 03/13/2018 by Mickey McCarter	in Food Talk, Live Review, Stars and Bars and tagged beer program, RAMMY Awards, RAMW, Restaurant Association of Metropolitan Washington, Washington Convention Center, wine program. Restaurant industry professionals gathered Monday at The Hamilton Live to hear the list of finalists for the 2018 RAMMY Awards, announced by the Restaurant Association Metropolitan Washington (RAMW). The winners will ultimately receive recognition at the black-tie RAMMY Awards Gala at the Washington Convention Center on Sunday, June 10. Any RAMW member who met all category requirements was eligible for nomination. Participating public voters (that is to say, you) will decide the winners in four categories: Favorite Gathering Place of the Year, Upscale Brunch of the Year, Casual Brunch of the Year, and Favorite Fast Bites of the Year. Vote for these categories online at http://www.nbcwashington.com/RAMMYS through Monday, April 30. Favorite Gathering Place of the Year: This nominee is a restaurant rooted in its neighborhood where guests come to eat, drink, and get together with friends repeatedly. The great atmosphere and good vibes are as important as the food and drink. The nominee must have been open for at least 2 years prior to Dec. 31, 2017. Upscale Brunch of the Year: The nominee is a restaurant that demonstrates a high standard of dining excellence and service for its brunch in an upscale environment. Brunch may be offered as full-service, buffet, or prix fixe. The nominee must have been in business a minimum of one year by Dec. 31, 2017. Casual Brunch of the Year: The nominee is a restaurant that demonstrates a dedication to dining excellence, service and value in a casual environment for brunch. Brunch may be offered as full-service, buffet, or prix fixe. The nominee must have been in operation for a minimum of one year as of Dec. 31, 2017. Favorite Fast Bites of the Year: This nominee is a delicatessen, quick-serve restaurant, mobile food vendor, or coffee shop (with food menu) that demonstrates a dedication to good food and good service in a fast-casual environment. The nominee must have been in operation for a minimum of one year as of Dec. 31, 2017. Cocktail Program of the Year: The establishment is distinguished by the quality, diversity, clarity and value of its craft cocktail program, evaluated separately from its beer, wine or other beverages. Nominees may be bars, restaurants, or any foodservice establishment with an exemplary cocktail program. The nominee continues to break new ground in education of its staff. The nominee must have been in operation for a minimum of one year as of Dec. 31, 2017. Beer Program of the Year: The establishment is distinguished by the quality, diversity, clarity and value of its beer program. Brewery restaurants and brew pubs are eligible for this category and will be judged based on the diversity and quality of their craft beer. The nominee continues to break new ground in education of its staff. The nominee must have been in operation for a minimum of one year as of Dec. 31, 2017. Wine Program of the Year: The establishment is distinguished by the quality, diversity, clarity and value of its wine program. The nominee’s wine program best suits the cuisine and style of the restaurant while enhancing the dining experience. Wine bars are eligible for this category and will be judged based on the diversity and quality of their offerings. The nominee continues to break new ground in education of its staff. The nominee must have been in operation for a minimum of one year as of Dec. 31, 2017. Service Program of the Year: This nominee is a restaurant that demonstrates a high standard of excellence in service across the restaurant – from the reservation process, to the host station, to every element of the dining experience. The nominee must have been in business a minimum of two years by Dec. 31, 2017. Casual Restaurant of the Year: The nominee is a restaurant that demonstrates a dedication to dining excellence, service and value in a casual environment. The nominee must have been in business a minimum of two years by Dec. 31, 2017. Upscale Casual Restaurant of the Year: The nominee is a restaurant that demonstrates a high standard of dining excellence and service in an upscale casual environment. The nominee must have been in business a minimum of two years by Dec. 31, 2017. New Restaurant of the Year: A restaurant that must have opened between Dec. 1, 2016, and Dec. 31, 2017, and already distinguishes itself as a pacesetter in food, beverage and service. Formal Fine Dining Restaurant of the Year: The nominee is a restaurant that demonstrates a high standard of excellence in food, service and atmosphere and shows dedication to sophisticated culinary techniques in a fine dining environment. The nominee must have been in business a minimum of two years by Dec. 31, 2017. Regional Food and Beverage Producer of the Year: This nominee is a food or beverage artisan who creates a product that is then utilized by chefs and restaurants. Nominees in this category may be cheese makers, coffee roasters, vintners, brewers, distillers, bread bakers, chocolatiers, honey producers, farmers, an ice cream/gelato company and many more. When the artisan is a restaurant or restaurant group, the products created must be utilized by chefs and/or restaurants outside of the maker’s restaurant group. The nominee must have been in business a minimum of one year by Dec. 31, 2017. Restaurateur of the Year: The nominee must be a working restaurateur or restaurant group who sets high standards in restaurant operations and entrepreneurship. Candidates must have been in the restaurant business for a minimum of five years in the Metropolitan Washington area. 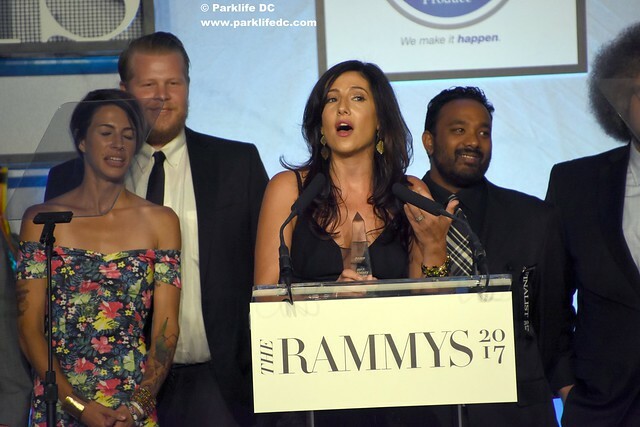 The winners will be announced at the 36th Annual RAMMY Awards Gala on Sunday, June 10, at the Walter E. Washington Convention Center. For more information regarding the awards and sponsorship opportunities, email therammys@ramw.org or call 202-331-5990. Buy individual tickets for the gala online.